This is what I had for lunch today. I didn’t cook it. Instead I ordered it, anticipated it, gazed at it, ordered mustard for it, and then demolished it……..mmmmmmmmm. For those of us who live in Turkey, we do get used to not having pork but we don’t forget it. Oh no we don’t! 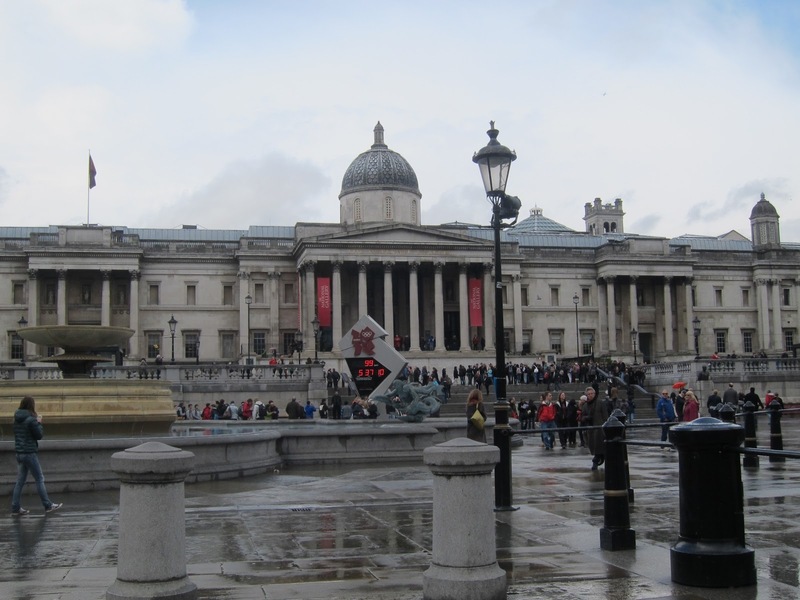 The Sainsbury Wing is to the left, just out of this picture. Very seasonal and oh so English. You can see what I chose at a glance! I have no idea what spelt is though. Maybe I missed something there? The place is great, service excellent (we had a Greek Cypriot waiter!) and the food just what it promises. 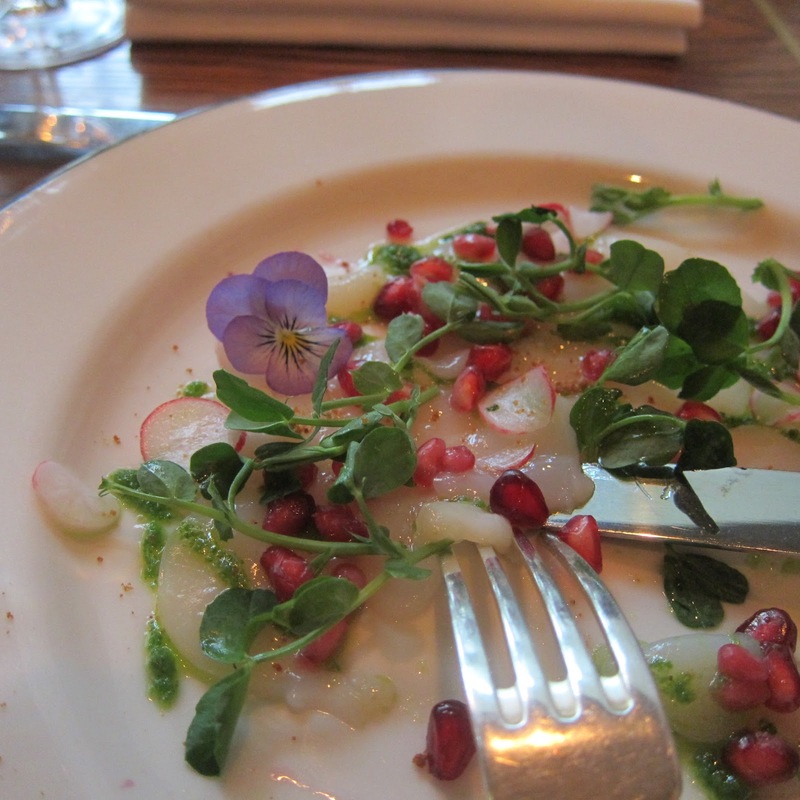 TT had the delicately presented starter below: scallop carpaccio with blood orange and nasturtiums. Actually, now I look at it, I see a tiny pansy and some pomegranate seeds too. 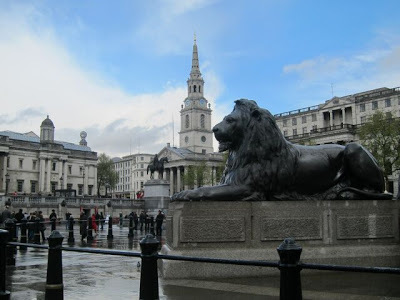 It ‘s great to be in London again but the weather is diabolical: it has rained and rained all day. Thank goodness we brought a brolly! what a great place for lunch on a rainy day! How fun!! My son & I were in London less than 2 weeks ago. We had great weather while we were there…thank goodness as it was his first time and we were outside a lot. 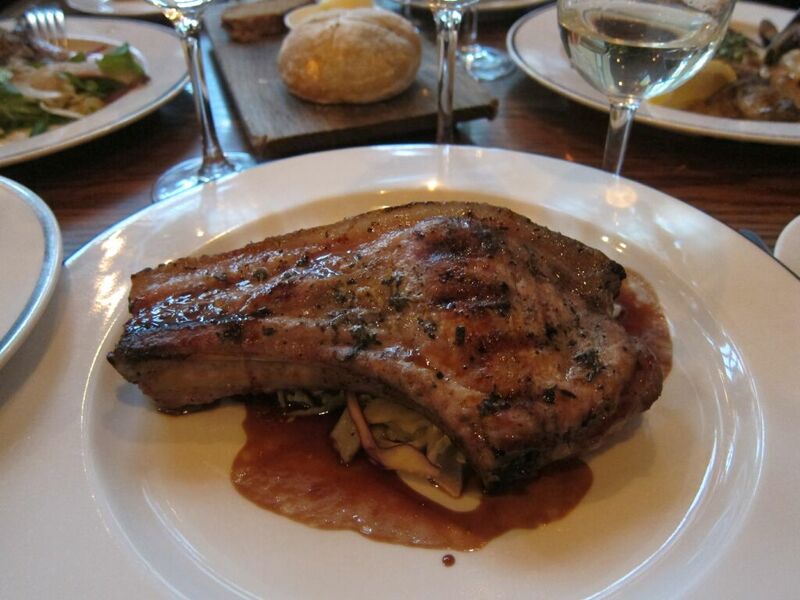 Yum on the pork chop!! I would find it difficult not to be able to get pork. It looks like you made up for it in grand fashion. Hope your London weather improved. I have fond memories of our visit there. Hi Penny! The sun is shining brightly today which is great as it's the day of the London Marathon! Yes, English food has improved out of all recognition! i don't know how i would survive without pork! i love how joy goes on a pork marathon each time she leaves turkey! that dinner sure looks good! spelt is a wheat grain. i use it in salads like you would use quinoa. have fun! I'm glad I had my chop then!! 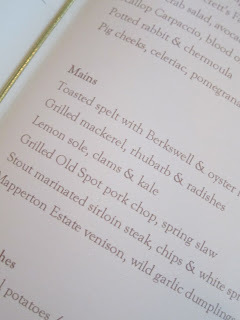 Mmm…pork! I just cooked up some of our leftover Dusseldorf sausages the other day here and made mashed potatoes. Cleaning out the freezer so I can stock up our pork again in Italy in a week. 😉 Enjoy London, Claudia! And I have good pint for me! Mmm you'll get good pork in Italy, that's for sure. London is just great -today we are going out towards Oxford .. the sun is shining for a change! So hard to read anything that followed the photo of the pork chop! Yum! Hey! you could leave a comment!! Nice to hear from you again! 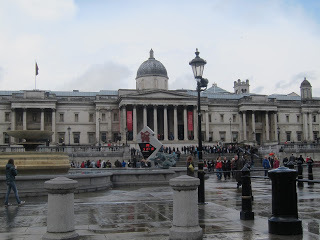 Very nice pictures of your visit to London. I hope you had a fabulous time. Spelt is an old grain that has suddenly become very fashionable to use in restaurants in Northern California. They actually grow a lot of spelt (epautre) in Provence and we find it in dishes quite often there when we go out to eat. Wettest April in 100 years! But we had a couple of sunny days while we were there. You're right – that looks like a lovely place for lunch.